InterFAX’s integration with Google Docs' Optical Character Recognition (OCR) feature enables Google Docs users, who receive faxes via InterFAX, to have faxes automatically converted into fully editable documents. As a result, Google Docs users can easily manipulate and edit incoming faxes, leading to greater flexibility, convenience and efficiency. 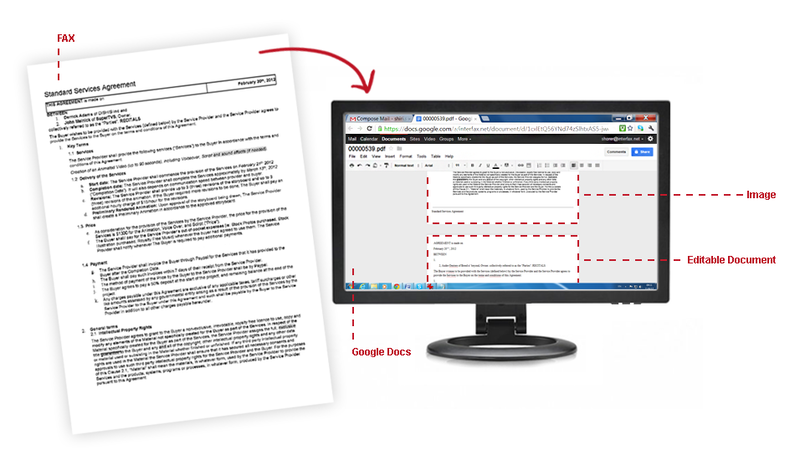 Utilization of Google Docs OCR requires no local installations and once the feature has been activated online, faxes received through InterFAX are automatically forwarded to Google Docs as PDF files where Google Docs' OCR feature automatically converts the received faxes into editable documents. Users are then able to load the documents and carry out any actions required, from filling out forms, through editing and searching text, saving and printing. To use Google OCR, users should start by setting Google Drive as the storage location for their received faxes, by navigating to the following: InterFAX CP > My Settings (menu item) > Incoming Options (menu item) > Notifications (menu item) > Advanced Settings (section title) > in the field "Incoming fax service" select the "Google Drive" option.